MITZPE RAMON–Three times we cross Nahal Zin (or Wadi Zin) on our way to Makhtesh Gadol from Mitzpe Ramon. Nahal Zin is an intermittent stream, meaning it is dry most of the time, but during the rainy season can have a considerable flow, even to the point of flooding. I’ve always seen it bone dry. Nahal Zin is 120 kilometers long with impressive canyons in its upper region and meandering channels in its lower parts. 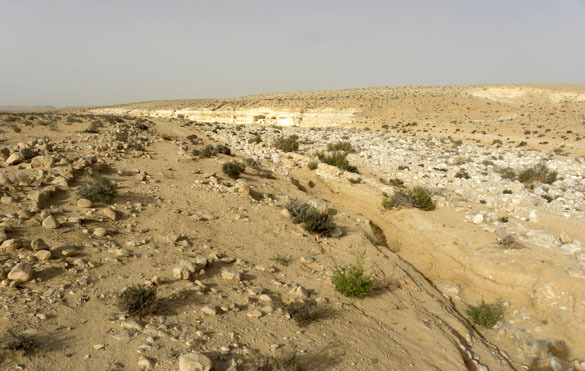 It is the largest wadi that begins in the Negev. The significance of Nahal Zin is that it is the defining feature of the “Wilderness of Zin” from biblical times. 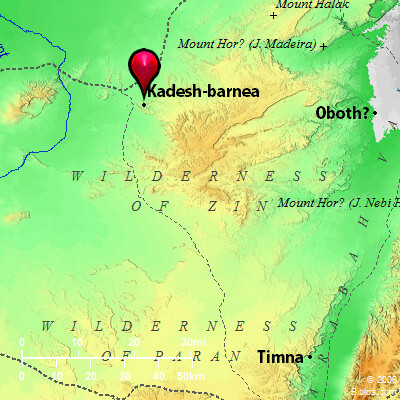 There is still some dispute about its location among biblical enthusiasts, but experts agree that it is essentially the northern portion of the Negev. The passions among the amateurs have much to do with the historicity of the Exodus events. This region was explored by T.E. Lawrence just before he became Lawrence of Arabia. 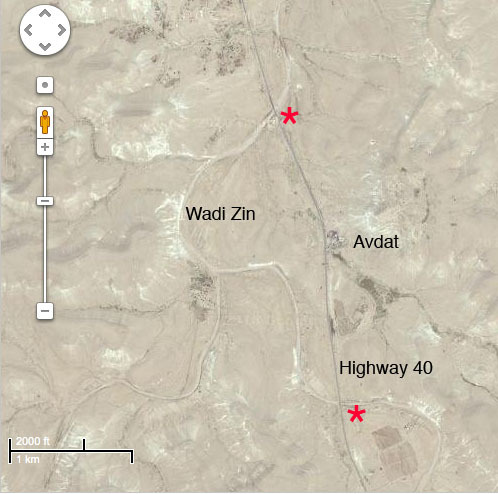 Google map image of Wadi Zin near Avdat. The red asterisks mark where it crosses Highway 40. 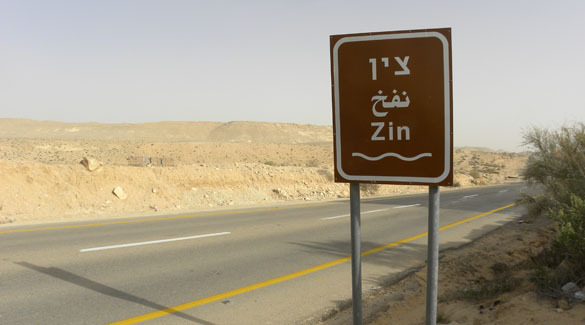 During our work in the Negev we do not usually see much of biblical relevance, so living and working in the Wilderness of Zin reminds us of just how deep the human history here runs. 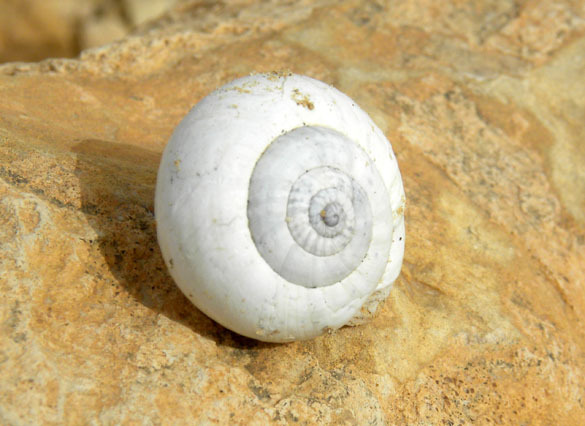 MITZPE RAMON, ISRAEL–This exquisite snail is not a fossil, although students in the field often mistake it for one. (Melissa did not, I quickly add.) It is a terrestrial, air-breathing pulmonate snail called Sphincterochila boissieri. 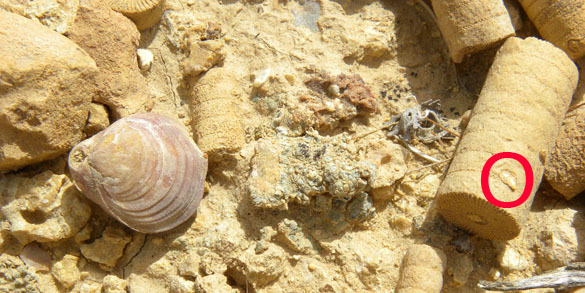 It is abundant in parts of the Negev and the Sinai Peninsula. 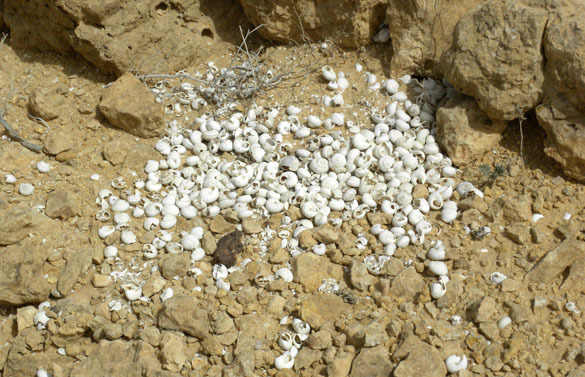 Its shell is relatively thick for a land-dwelling mollusk, so it becomes a common constituent of the desert soil in certain habitats. Sphincterochila boissieri is well adapted to its desert environment. It has a predator-resistant shell with a small aperture to reduce moisture loss. With its white color it reflects significant amounts of solar energy, staying relatively cool. (Compare this to the black ground beetle in the last post. It is most active in the winter and stays in shady areas during the summer.) They are active for only a few days during the winter rainy season, doing all their feeding (on algae, moss and lichens), mating and egg-laying. For the rest of the year they stay dormant, often in the soil or attached to rocks and woody plants. While dormant, they pull all the way back into the second and third whorls of their shell to stay as moist as possible. They can survive droughts, and thus do no feeding, for at least six years. So, S. boissieri may not be one of our fossil targets, but it is a silent (and completely unmoving) companion during our fieldwork. It has our respect! Yom-Tov Y. 1971. The biology of two desert snails Trochoidea (Xerocrassa) seetzeni and Sphincterochila boissieri. Israel Journal of Zoology 20: 231-248. Shachak M., Chapman E.A. and Orr Y. 1976. Some aspects of the ecology of the desert snail Sphincterochila boissieri in relation to water and energy flow. Israel Journal of Medical Science 12: 887-891. MITZPE RAMON, ISRAEL–One reason why I like working in the Negev is that it was already familiar when I first visited in 2003. I grew up in the Mojave Desert of southern California, which is very similar to the Negev in many ways. The ecological analogues between the two deserts are astounding, from “jackrabbits” to “sagebrush”. 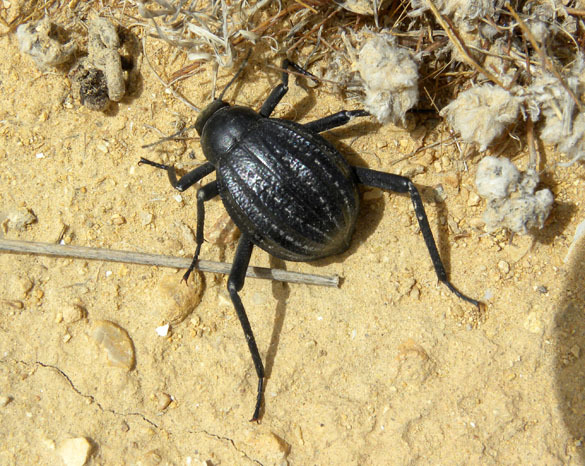 The ground beetle above is a type we see in abundance here in Israel. Anyone from the Mojave Desert would immediately recognize it from the color and behavior as what we called a “stink bug” as kids. They move frenetically over the hot ground with their heads down and abdomens high. Below is an example of a Mojave equivalent: a Desert Spider Beetle (Cysteodemus armatus). It is ordinarily black but is covered with yellow pollen in the spring. 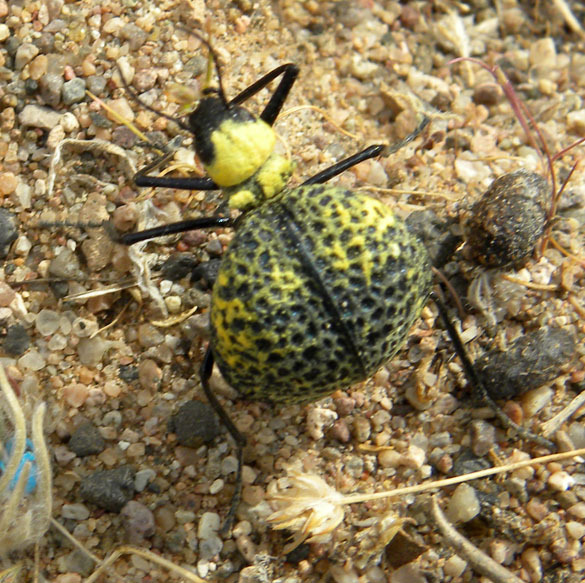 We saw this beetle on our departmental Mojave Field Trip a year ago. When I post images of the Negev wildflowers we’ve seen there will again be familiar to Americans — some almost identical to Mojave equivalents. These analogues show how similar selective pressures can produce very similar effects in unrelated groups. MITZPE RAMON, ISRAEL–The above is an untouched view of an eroding marl of the Matmor Formation (Middle Jurassic) in Makhtesh Gadol. I simply placed a one shekel coin in the scene for scale. This is why we love this place — the fossils are just rolling out of the outcrops (once you know where to look). Our ultimate goal is to describe the communities in this particular unit, and you can see that we have rich material to work with. You can try to identify the fossils you see here. I’ll give the answers below! Melissa walking across the northern end of Makhtesh Gadol through the middle part of the Matmor Formation. You can see in the distance that dust (and the wind that brought it) is still an issue. Ready for the answers to the fossil quiz above? 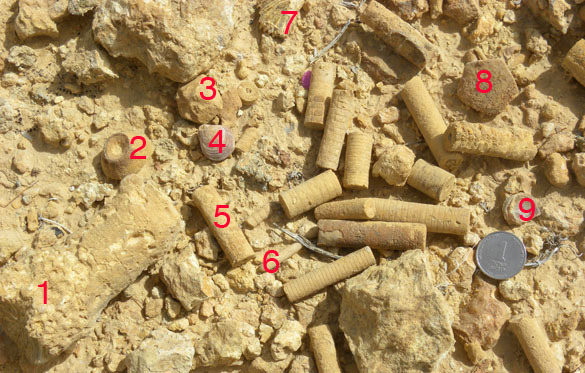 1 = scleractinian coral; 2 = Apiocrinites (crinoid) calyx base; 3 = Apiocrinites calyx plate; 4 = terebratulid brachiopod; 5 = Apiocrinites stem fragment; 6 = echinoid spine; 7 = oyster; 8 = Apiocrinites calyx plate; 9 = another kind of oyster. In a close-up yet another type of brachiopod is visible. The red circle shows a thecideide brachiopod (no doubt Moorellina negevensis) attached to a crinoid column. Cool, eh? And this is just a taste of what we saw today. Heaven indeed.